16th August 2016. DED are pleased to announce the recruitment of Paul Maginess to further strengthen their position and offering in the field of Auto ID and Data Collection. 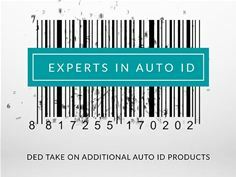 In addition, DED will be taking on further product ranges to complement their existing range of Auto ID equipment. Products will be available from manufacturers including M3 Mobile, Arbor, Bluebird – Pidion, TSC, SOTI and 42 Gears to name just a few. The addition of the M3 Mobile products will enhance DED’s offering of rugged PDA’s and Data Collection Devices. M3 are renowned for focusing on innovation and offer a combination of durability and high performance whilst ensuring a wide range of configurations on connectivity and functionality for both indoor and outdoor use. The Arbor range of products adds to DED’s offering of rugged tablet PC’s and services a more comprehensive range of applications. Arbor offer intelligent, high performance products for mobile technology that hold a firm foothold in the embedded and network computing sector. Further mobile devices are expected to be added to the portfolio. The TSC range of rugged barcode label printers. Synonymous with high performance and exceptional quality of print, the TSC brand is well-known globally for delivering on reliability whilst offering ease of use and dependable construction. Software for the Auto ID product comes in the form of SOTI and 42 Gears. These award winning and industry leading software applications solve the unique challenges involved in managing, securing, supporting and tracking mobile and desktop computing devices across all platforms. Ranges from additional manufacturers are also likely to be made available from DED. Please see the DED website atwww.ded.co.uk for further information as these new ranges are introduced. Formed in 1983, DED Limited based in Lydd, Kent. The ensuing years have seen the company grow to become a leader in the design, manufacture and distribution of: ‘Specialist’–Kiosk/Receipt/Label/Ticket–Printers, PoS Equipment, CCD and Barcode Scanners, Magnetic and Smart Card Readers & Writers, Cash Drawers, Pole Displays, Plastic Card Printers and Touchscreen Terminals. Accredited by NQA to the BS EN ISO 9001:2008 Quality Standard, DED is a major distributor for a number of world-class companies such as: Star Micronics, Datacard, Evolis, Zebra, Newland, Honeywell, Posiflex, Bixolon, Ergonomic Solutions, CipherLab, Tysso, Socket Mobile, Sbarco, iZettle, PayPal, Payleven, Nippon Primex and Axiohm. DED also supply NFive and Exchange IT Software.